What a game it was in Salta. The Wallabies performed the “great escape” goaded by Michael Cheika’s impassioned half time spray. However, there are some defensive issues that are at the heart of our performance problems and we’ll look at these in this analysis. You simply can’t concede four tries in a test match and expect to win. It usually takes more than one defensive error to concede a try because defence systems are designed to have secondary cover. In this first try Pablo Matera ran a beautiful hard line and broke the left shoulder tackle of Bernard Foley. That’s disappointing but Matera is a beast so now it’s Will Genia’s job as the sweeper to clean up Foley’s mess. The disappointing thing for Nathan Grey (our defence coach) is that both our first line and secondary defence could fail so early in a test match. Matera runs 45m to score, the defence will be embarrassed by this clip in the team review. The next try is a killer for the Wallabies because they had worked some beautiful edge attack to release Reece Hodge and great a scoring chance. As Hodge pops up an offload that would have probably set up a Wallaby try, Nicolas Sanchez swoops and intercepts the ball. Completely against the run of play Emiliano Boffelli scores for Argentina and we’re down two tries inside 4 minutes. Conceding a try this way is annoying but it’s not something the defence coach can work on. Test rugby (like life) can be cruel sometimes. When the Wallabies conceded this third try I’m surprised Michael Cheika didn’t throw something or someone out of the coach’s box. Our try line defence system should have lots of bodies in the front line and on their feet. Instead we were making arm tackles with players strewn on the deck when we should have our bodies in front winning collisions and muscling up. Picture the Roosters defence in the NRL Grand Final. You defend your try line as if someone is coming through the door after your family. Instead we fell off tackles and Argentina made us look bloody average (no make that poor). We don’t need the scrum half sweeping so close to the line. If he gets in the front line we have a better chance of getting more bodies in front and stopping the Pumas in their tracks. Not only is the scrum half out of position, but his sweeping defence is again ineffective. 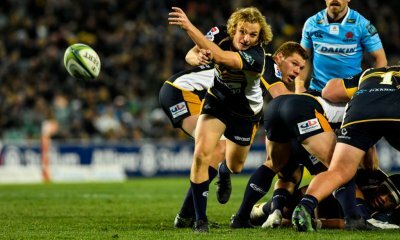 The Wallabies have defence issues and we need some players to step up in this area. Michael Cheika doesn’t need a mentor or another selector. He needs to show his team the Roosters Defence effort in the NRL Grand Final. It’s no wonder Michael Cheika went ballistic when he watched his team concede this 4th try. From a centre field ruck the Pumas put on a run-around play and again busted our front line of defence due to a left shoulder tackle miss from Bernard Foley. Again the secondary defence line was Will Genia playing the sweeping role. Again he failed to make an impact in defence. The Crusaders managed to win the 2018 Super Rugby title by hiding Richie Mo’unga on the blind side wing. If Bernard Foley is Michael Cheika’s preferred fly half it’s time for Nathan Grey to revisit this tactic. He also has to work with Will Genia on his sweeping tracking lines as Genia is getting beaten far too easily in the secondary defence line. For mine Will Genia is too deep behind the line and he’s not tracking inside the ball. He might be worried about his speed and corner flagging. In his defence he does cover a lot of territory in attack so he’s probably under the pump a bit when it’s time for his defence duties. Unfortunately, when the front line is defending poorly it puts the spotlight on the sweeper. I hope Michael Cheika stands by his coaches when he fronts the Rugby AU Board but he’ll need to challenge Nathan Grey to come up with a better structure and Mick Byrne to sort out Bernard Foley’s left shoulder tackling. I appreciate it’s an easy game to play from the grand stand. Many Thanks Brian. Pretty simple stuff. It’s good when a simple plod like me has observations that are then supported by guys who know what they are talking about. They did a good job targeting Foley in attack. Thanks Brian. Great analysis as always. I was wondering your thoughts on the defensive line of the Wallabies. In try one and three, a common wallaby mistake appeared. In try 1 Hooper is 2-3 metres in front of Foley (right shoulder) and Sio? (left shoulder). Matera angles his run directly through the gap were Hooper would be if they were in a line. So Foley is now forced to defend 5 metres of space instead of 2 metres on his left side. This is repeated with different players in try 3. This time it was Koroibete coming out the line and creating space that the Argentine player angled back in to. It seems they are a single line of defense until the last moment. As the player receives the pass, Hooper and Koroibete accelerate toward the attack whilst the other players prop and wait. It seems to be common and I wonder if it is the deliberate design of the defensive structure or a lack of communication on the field in the heat of the moment forcing the defensive error. To me, these error in judgements or tactics are exposing and making what you highlight above, e.g. sweeper and Foley’s left shoulder defense, more prominent. I think you’re right in starting to blame the system (as well as players, if not more) on The Rugby Ruckus pod they did a deep analysis on defense including the run up phases to any missed tackle and it was the case 7/10 that the system was causing the players to be out of position including the first Foley tackle. He was covering metres of space and had an overlap outside to defend too. He’s not the best defender but that one wasnt on him. They also pointed out how the defensive line is not flat. An obvious one and party to blame is the shoot up tackle. This was corrected on the second half. I agree it’s a systems issue, but I’d note the first try? Hooper and Foley were pretty consistent in their vertical alignment, the issue was their horizontal spacing, and their connection. As the pass from Sanchez goes to Matera, look where Foley’s eyes are. Outside. He’s panicking, because there’s no support out there. Numbers were that Rodda had Sanchez, Sio had the next two runners (sort of ok, because the runners were vertically misaligned, so there was time to adjust targets between the passing of the first runner and the arrival of the second runner, with Rodda as inside cover), and Hooper had the next two. But because it was a flat ball at two genuine running options, Hooper wasn’t able to pick which runner was going to receive the ball, and Sanchez picked the right one. Hooper needed support, he needed Foley connected on his outside shoulder, but Foley was stressed because there as a significant gap outside. If Foley had been properly aligned and blitzed with Hooper, they would’ve cut this one off. Because the runners were flat enough to do that – Foley could’ve wrapped Matera as he received the ball, and without an offload, that’s it – reset. Yes, the wide ball option would’ve been available to Sanchez, but if you’re blitzing, you’ve got to blitz to the ball line (not beyond it as we’ve too often been guilty of doing) then push out hard to cover the width if they beat you with a pass (which is the risk of blitzing, that they get over/outside you). Our linespeed there wasn’t anything like full blitz – it was ok, but not a blitz. But our alignment – having that big gap in the middle of the defensive line – really needed a hard blitz, to prevent the ball getting out. I can’t help when reading your comments that the absence of communication from people like Hooper in the defensive line is a massive issue. Bringing in people like Toomua and TK (who you mention below) would solve this. They are great defensive communicators. Also, I wonder how much the fullback (whoever it is at a given point in the game) and the sweeper are communicating to the front line. We called that live. . .. if Foley manned up correctly he would have noticed HIS man was running an angle directly between himself and his inside buddy who was rushing. Another example of why Foley is a poor defender with bad vision. I picked live that it was Foley who missed the tackle, what I didn’t pick live was that he was panicking about the overlap outside him. If the system were better implemented, then there’d be more confidence in what to do there. That he should be closer and blitz on the short pass, and be ready to chase out hard if it’s a long pass. Thanks Brian, well explained and highlighting some crucial issues that seem to repeat themselves. In fairness to Foley (and I’m really not his biggest fan) in the fourth try, someone (I think it’s the 8 but I can’t see his number clearly so I won’t point fingers) hares up out of the defensive line. Foley’s got a load of space to cover on his left that Argentina run their attack through… Yes, you might hope a great tackler would make that, but there are a lot of 10’s in world rugby who wouldn’t. Eloise, that try is EXACTLY what we talked about the other day! It’s the other way you can beat the rush defence. Pocock rushes up and hits Lavinini, who shifts the ball out the back to the scrum half on his wrap around. Koroibete also rushes up and forces the scrum half to hit his 10 early. The looping run from the 9 and 10 has created a near-ruck overlap, in that the Wallabies appear to be numbered up enough outside Foley, but there’s no longer enough defenders inside Foley to cover the attacking options, because Foley’s man isn’t Gonzales Iglesias (#22, replacement 10 for Sanchez), it’s the 12 he was tracking before he shifted back infield to chase 22. 12 was in a pod of three attackers. Hanigan was completely ineffective, he was tangled with the pod around Lavinini (where Pocock made his tackle). So, Foley’s covering the 12, Beale’s got the man outside him, and the Wallabies definitely don’t have an oversupply of outside defenders when you see them chasing the ball in for the try. But look where Beale is at the point where Foley realizes he has to step inside. He’s even further upfield than Foley. So, even though the outside defence (in this instance) hasn’t rushed up as hard as the inside defence did (with Pocock and Koroibete), it’s still rushed up quickly enough that the attacking 12 is downfield of his defender before the ball leaves the 10. So, we’re looking at some great handling around the first receiver to buy time in that attacking 10 channel which allows the attacking team to attack on the inside shoulder of the charging defender on a rush defence. Where the outside charging defence overruns the play, and the defensive backline ends up going past the attackers before the ball gets out there. It’s not difficult, it’s just catch/pass, but it’s great to watch! Back in 2013, there was a lot of analysis about how teams were refusing to concede line breaks anymore. It was an era of sliding defences, rather than rush defences. I remember seeing analysis where, faced with a 5 on 2 overlap, Mowen and Horwill defended by retreating fully 35m upfield, but stayed behind the ball. The term was ‘jockeying’. The attack shifted the ball, eventually narrowing the options and making it possible for the defenders to make the right decision, and buying time for more defenders to join the first two. It’s great to have this new line speed in defence, but we seem to have forgotten how to defend without blitzing constantly and unendingly. This is a perfect example of non-stop blitzing. We’ve blitzed the first ball carrier, the second ball carrier, and ended up shorthanded where the ball was, expecting it to move out. The defence has made decisions first, which means the attack could react. Whoever gets to make the last decision (attacker/defender) has the advantage. Imagine if the first tackle had been the extent of the blitz. Pocock hits, the ball is offloaded. That’s ok, because Pocock’s taken out his man, and he’s still upfield of the ball. And he’s made his tackle with a great ‘defensive triangle’ of support there – Pocock’s leading Hanigan and Koroibete, they’re well connected. But there’s no connection whatsoever between Foley and Koroibete – in fact, Foley’s looking outside, just as Koroibete’s stepping infield to tackle the scrumhalf. If Koroibete at this point doesn’t blitz, doesn’t make a decision on who to hit, but instead buys time, maybe jockeys back a little rather than stepping infield and hitting the 9, he can cover 22. He can hold to see if the 10’s going to receive the ball, and follow the 9 if 22 doesn’t receive the ball. If anyone should be covering 9, it’s Hanigan, trailing the 9 from the ruck (and he’s doing that, though he did go the wrong way around #4 (headgear) when he tried to continue chasing upfield on a lateral ball runner (#9)). I’m not complaining about Ned here – he’s still in a position to cover the 9 from the inside. But he could’ve been in an even better position if he’d not continued blitzing, if he’d kept himself between the 9 and tryline. Much of the skill in NFL defence is picking when to blitz, when not to blitz, and how to conceal a blitz. This skill clearly isn’t understood by the Wallaby defensive callers presently. I hadn’t really looked at the attack, but with my shiny new glasses I’ve gone back and looked and yes, you’re right. Good question Eloise, really good question… There’s just no logic in hitting the 9. It’s not about hitting the guy who has the ball, it’s about hitting the guy who’s about to receive the ball. Usually, the second receiver, or a forward runner one off the ruck before he gets up a head of steam (just as Pocock hit Lavinini). So, you want to blitz when you know who’s getting the ball. No point blitzing before the pass is thrown – you’ll give up a Barrett/Pollard-Faf try. But blitz the second the passer is committed. Don’t move up slowly – otherwise you could end up in no mans land, like Hooper and Foley for Matera’s try. Communicate, make the call. All that said, blitzing on the 9 and 10, which you’d think would make them spread the ball faster, instead ended up creating three tries that involved inside balls (2 and 3) and runners on unders lines, especially inside Foley. It’s pretty clear in my mind that TK would make a MASSIVE difference to the defensive line. He’s a fantastic defensive organizer, I genuinely believe he’s up there with the very best in the world. But one bloke isn’t going to fix this. He can’t cover every position on the field. We need the players to understand the system and their roles within it. Clearly that’s not currently the case – they don’t understand it, they don’t communicate with each other, and so they don’t work together. If you just watch both the AB v Boks games you could see both sides talking and waving their hands to each other, regardless of who had the ball. If you watch good commentators talking about it, they’ll talk about how defence requires communication. Maybe not when you’re scrambling like crazy to cover a line break but when you’re setting your structures and defending normally. If someone who barely played beyond the schoolgirl level knows and understands that, why don’t this mob, who are meant to be the best players in the country? Heck, I remember being coached on it when I was about 14 or so and playing. That’s pretty much 40 years ago now. It was nothing fancy then, just numbering up, saying who was my “man” (girl actually, but you get the idea) or that I was first guard, second guard at the ruck (they call them guard, bodyguard now). Or saying nothing because I was in the heap on the floor. It wasn’t rocket science. We didn’t do blitz or slide defences or anything fancy, just number up, press forward and try to make our tackles. A modern, test level attack would pick holes in it, I’m sure. But I’m not sure it would be worse than we’ve seen in most of the matches in 2018. It was No 7 – HOOPER!! HE DOES IT A LOT AND SEVERAL TIMES IN THIS MATCH IT COST US A TRY. FOLEY’S DEFENCE IS AN ISSUE AND HAS BEEN FOR A LONG TIME BUT HE WASN’T HELPED BY HIS MATE AND CAPTAIN IN THIS INSTANCE!!! Could be. He’s certainly done it a lot and cost the side a try or two. Actually gave Barrett all on his own a couple IIRC. I can’t quite work out if this team can be improved in this facet of the game to the level required? Is this possible? Or are they individually just not good enough ability wise to become better defenders? Because they have really sucked for such a long time. As individuals and as a team. I wonder how the coaching staff and the players think they can win a WC with such a consistently poor defence? Every team in history that has won that tournament has had unstoppable defence. It’s a pre-requisite to success. Thanks Brian, good article and I do agree with your last line! Really good analysis by the commenters here too. Thanks all. a) Surely it is incumbent on Foley to push up with him. I’ve always coached that the next defender in line reads the cues of his inside teammate. b) It looks to me like Foley actually makes Hooper seem as if he has shot more than he has. 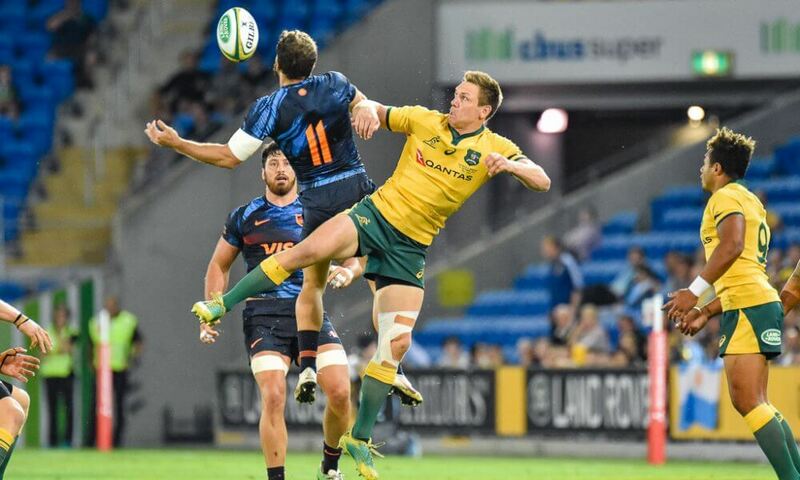 Foley actually slows down and sits into his hips – the prime tactic of a defender who knows he is outmanned physically and needs to get set to make a bootstraps tackle. Unfortunately, he sits too early and isn’t able to react to the runner’s angled line. I am not Hooper’s biggest supporter, but I think this one is squarely on Foley. 2) For the second try, I’m not saying Beale could have recovered to make a scramble tackle, but he certainly won’t if he turns back to complain to the ref about a forward pass like he does. When you as a coach spend so much of your career screaming about refs though, you can’t be surprised when your players react like this. As an aside, look at how Hodge reacts to the knock-on in the build up to Australia’s first try. It’s a clear knock-on – there is no way the ref can miss it, but he still chucks his hands up. I hate it when Murray and Sexton do this for Ireland, but at least they seem to do it in a considered way rather than as a reaction – i.e. they are doing it when they don’t need to be focused on and reacting to the play. 3) Yes, Genia’s sweeping here is woeful – but what is Hodge doing? In Kiwi-land, or even in the NH, a defender in his position here would see this as a great chance of a fish-boning rib-breaker. Instead, he allows himself to be gently fended by someone who is in the process of catching an offload one-handed. Seems like there is a bit of mongrel missing there. 4) Beale shot up on the loop play from the previous set-piece, then Korobeite does the same just prior to the try. Obviously, they have been taught to do this, and it is a valid tactic. But if the defense is going to push past the looped man, the whole defense needs to push past. Foley doesn’t, which gives the attacking player time to get inside onto his weak shoulder. a) Like a Barrett or a Sexton, he is a big, strong interior defender who can put up with big runners down his channel. b) He is a wily 13 type defender who can read and react to a dynamic situation inside him to quickly reposition himself. Foley fails at both of these tasks here, which would make hiding him Mo’unga stylde a tad difficult – though as a short blindside defender it is possible that he doesn’t have to make too many tough reads and attackers tend not to be able to just truck through a blind channel in the same fashion. In saying that, this is also just one game, so maybe he had an off day. It embarrasses me a tad it took an article naming and shaming to get people noticing that once again Bernard’s Foley’s strike again. But wait. . ….isnt that why QUADE Cooper was dropped and so many apparently don’t rate him. If only everyone was held to the same mark hey. .. … .